Toward the beginning of this Christmas season, my daughter printed out a Family Christmas List, with spaces for gift requests from each of us. She posted it in a central location in the kitchen. At first I couldn’t think of a single item for the list. I have enough stuff. And on those occasions when I do need something, I generally prefer to pick it out myself. Soon I thought of one thing: a nice winter scarf suitable for dog-walking. I’ve had the same one since 1987. While it’s still perfectly good, another would be welcome, and D has a good eye for scarves. Somewhat later, in a flash of light bulb inspiration, my dream gift popped into my head: shoe storage! This, indeed, may be a gift that keeps on giving. Our house, as I’ve noted before, is closet-challenged. It’s a four-square farmhouse built in 1920. Closets and bathrooms were added during the early 1970s. Orange shag carpeting was also installed in copious amounts at this time, one reason the house remained on the market for so long before we bought it ten years ago. We have a wide center hall but no optimal storage on the first floor unless one counts the closets in a bathroom and in an office that doubles as a bedroom when overnight guests are plentiful. Neither space is ideally located, to say the least. For a family of three, we have an inordinate number of shoes, especially those for outdoor activities. We have shoes for running, for gardening, for hiking, for use in snow, in rain, in rivers and oceans. We have high boots, low boots and medium boots, most of which are typically caked with mud and leaf debris. We have many pairs of old, scruffy shoes saved for the messiest of uses: walking through mucky fields, exploring the creek, climbing trees, working in the garage or the basement, etc. Some are very nearly too small or worn out but still may be of use in a pinch, if, say, all our other shoes were swept away in a tornado. These are too shabby to be given away to any charitable organization, but too good, it seems, for outright disposal. As H’s father would say, we have back-ups for our back-up shoes. And then there are the comfy shoes, the legions of slippers, rarely worn. They stay with us, it seems, out of habit and for the sake of occupying space. 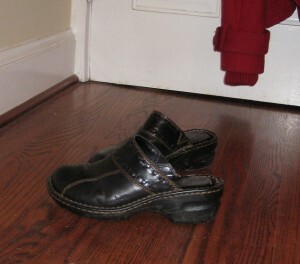 Our shoes tend to congregate in the kitchen around the back door and in the hall by the basement door. Like so much household detritus, they evidently have the ability to multiply spontaneously. Opening either door is impossible without first rearranging great piles of shoes. I dislike this process as much as I dislike moving the little things off the kitchen table. I’ve been complaining about our lack of shoe storage for nearly as long as we’ve lived here, to little avail. I usually deal with it by stomping around angrily and muttering derogotory remarks about my beloved family members while hauling their shoes upstairs or downstairs. This does not make me happy. I finally realized that the problem might be solved by incorporating it into a gift request. My husband and daughter take gift requests very seriously. They excel at tracking down gifts (and they enjoy gift wrapping challenges, but that’s another story.) Several years ago I began asking that the impatiens be planted as a Mother’s Day present. Therefore, on Christmas morning, I opened a substantial package containing varieties of shoe storage: hanging racks, standing racks, storage boxes with hinged lids, others that defy easy description. On December 26, shoe storage solutions were installed and in use. I was delighted. Change had arrived. H and D have adjusted swimmingly; their shoes are tucked away as intended. The problem now seems to be that I can’t get used to the new system. I keep leaving my shoes by the doors to the kitchen and basement. I have received two tickets from the Home Improvement and Neatness Patrol for illegal shoe deposit. I’m going to have to get with the program. I can’t be responsible for the failure of shoe storage; I want that gift to keep on giving. My shoes, conspicuously all alone. I resolve to do better! Our church’s candlelight Christmas Eve service is one of the highlights of the year. 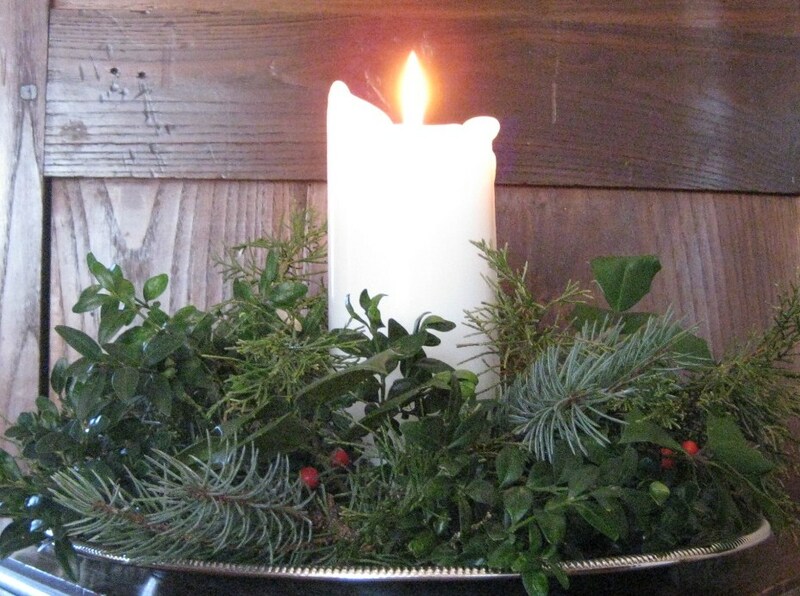 Each person receives a small white candle upon entering. Toward the end of the service, the sanctuary goes dark. The acolytes assist the congregation with the lighting of the individual, hand-held candles. 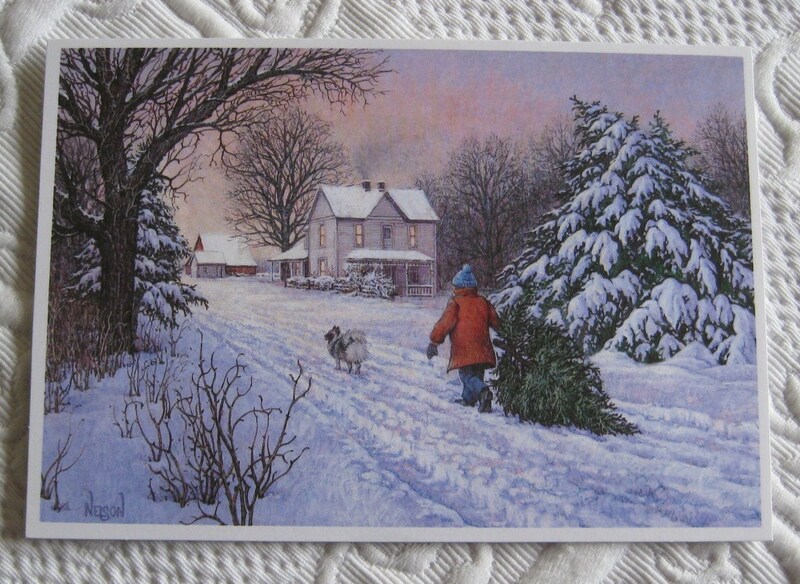 Gradually, while we sing Silent Night, the light grows. By the final verse, the sanctuary is brightly glowing, as each member of the congregation holds high a lighted candle. The process is a beautiful expression of God’s love. Into the darkness of the world, God sent a light. It appeared dim and insignificant at first. But soon it grew brighter and kindled countless other lights. When we allow the light of God’s gift to come alive within us, we glow. And we, in turn, have the power to spread the light. Our combined light is a mighty force. The darkness will not overcome it. The source of the light is one baby, born to an unknown young woman and witnessed only by her trusting husband and perhaps the animals of a stable. In an unlikely juxtaposition, a multitude of angels announces the birth not to the ruling elite, but to shepherds in the fields outside of town. (This is nevertheless appropriate, because the baby’s great ancestor David was a shepherd boy when he was hand-picked to be king.) Before long, the birth of the child has attracted the attention of wise men from distant Eastern lands. Led by a singular star, they embark on a long journey to find the humble family. They bow down in awe before the baby and present him with rare and costly gifts. God’s great gift turns the world upside down, upsets its expected order. There is no room in the comfort of any inn for God’s only son. Angels appear to lowly shepherds, and kings worship a baby. Allowing God’s light to shine within us may lead us to unexpected places. The tidiness of our lives is likely to be overturned. This is the difficulty in letting our inner light shine. Its power may summon us to go where we would rather not venture. It may be more convenient to quench that light, to hide it under a bushel. But knowing that the flame that dwells within us is from God, the light of salvation, ever-present, we can have the courage to go where it wills us. The darkness will not overcome it. We need not fear, for we are never alone. 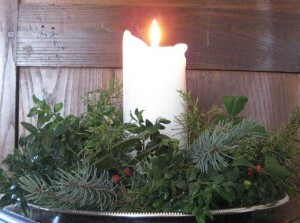 On this Christmas Eve, I pray for the light to be kindled and nourished throughout the world. And I pray for the strength to let the light be my guide. Do not be afraid; for see—I bring you good news of great joy for all the people: to you is born this day in the city of David a Savior, who is the Messiah, the Lord. As everyone in my family knows, one of my most frequent complaints concerns our vast and ever-growing accumulation of stuff: the multitudinous thingamajigs, treasured by some, considered garbage by others. These are the small, awkward, ambiguous objects I seem to be constantly moving from the kitchen table. They tend to scatter all over the floor, but I feel compelled to seek out every last one because the dog may eat them. Occasionally I think I could walk away from all the stuff without a second thought, free at last. Certainly I could walk away from all their stuff. Once in a while, I even think I could leave my stuff. 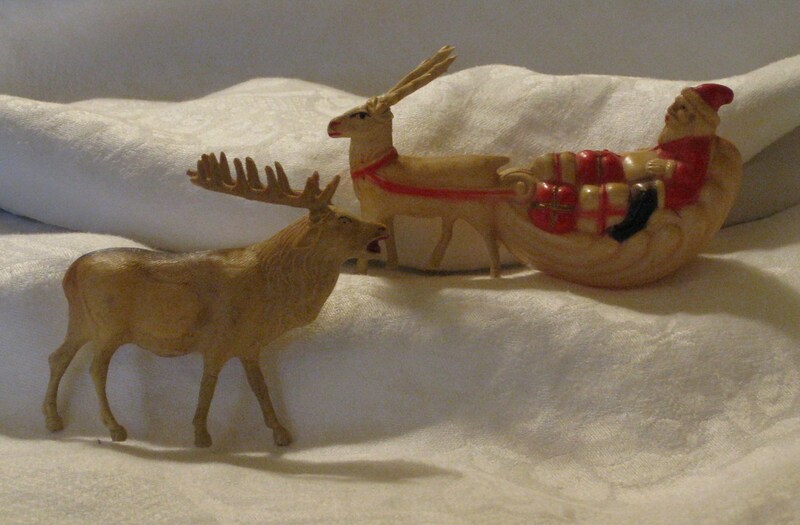 Then, I remember these two small, rather subdued-looking Christmas figures: a stern-faced Santa with his sleigh pulled by a single reindeer, and another, somewhat larger, more finely detailed reindeer. I found them at our church yard sale, at a table of miscellaneous junk offered by an extremely old man. I got distracted, moved on, and forgot about them. I was returning home, waiting at an everlasting traffic light, when I remembered them. I was being silly, I told myself. I didn’t need more stuff. But I couldn’t follow through. I wanted those two Christmas knickknacks. They were calling to me. I turned around, had to wait for the light again. 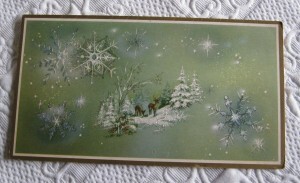 I got back to the old man’s table, and miracle of miracles, they were still there. Apparently their plaintive cry was inaudible to others. I think I paid a quarter apiece, his asking price. I didn’t haggle. I’m so glad I doubled back for them. My appreciation of these little trinkets has nothing to do with monetary value; I’m under no misconception about getting the deal of the century or heading off to Antiques Road Show. The Santa appeared in a December issue of Martha Stewart Living, in an article about celluloid holiday figures from the 1920s – 50s that were sold at 5 & Dime stores. My little Santa may date from the 1930s. No doubt he’s worth more than a quarter, but not substantially. I just like these two little doodads. I find them inexplicably pleasing, even comforting. 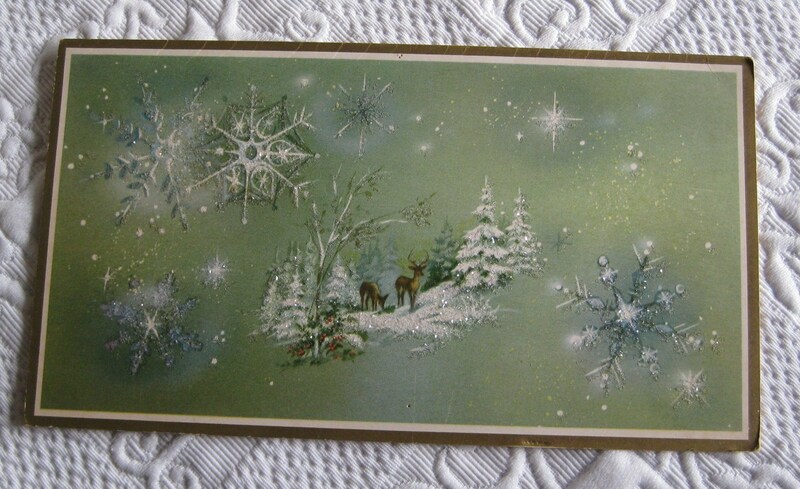 They are reminders of a simpler time, when we weren’t quite so awash in stuff, when the choices were fewer, when each little thing meant more. I can see the old man who sold them to me, a Depression-era child (looking something like Ralphie in A Christmas Story) using his allowance savings to buy these as a gift for his mother or sister. I will protect my tiny Santa and reindeer from those who might regard them less highly. I will try to respect the little things that beckon to my family members but not to me. And I won’t leave my treasures on the kitchen table. 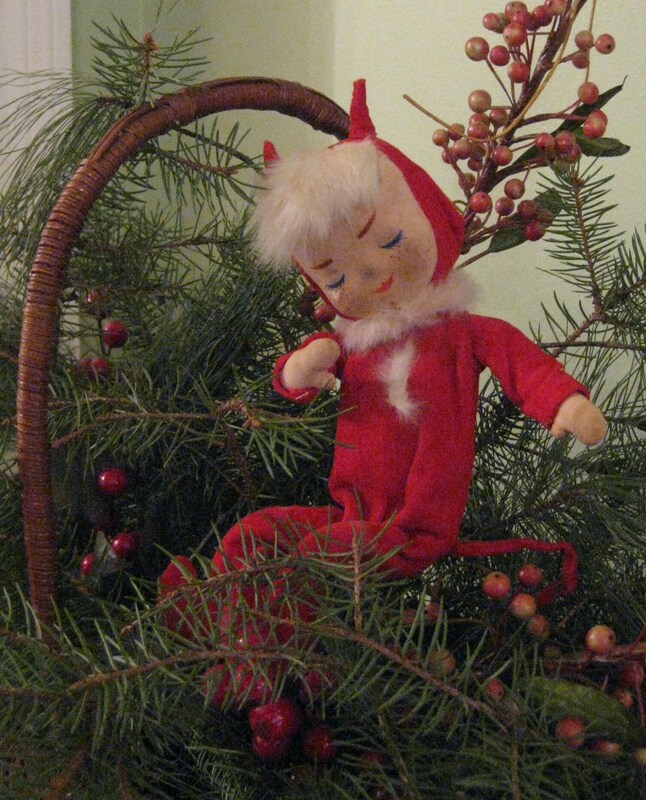 On my first Christmas, a neighbor gave me this stuffed doll wearing a devil costume. Her well-worn face attests to my love for her. 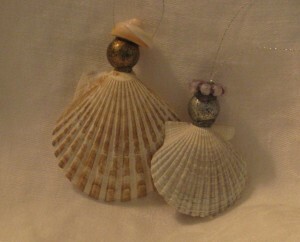 She appeared yearly with the Christmas ornaments. Her outfit is similar to the somewhat later elves (as in The Elf on the Shelf) that came to join her. A stuffed Rudolf was another of her companions. She has a firmly stuffed, bendable body, painted face, white rabbit fur hair and collar, and she’s sewn into a red velvet devil suit with a wired tail. Why a devil for Christmas, I have always wondered? She has a very sweet face. Is she intended as an angel dressed as a devil? As a commentary on good masquerading as evil? A reference to our dual nature? I often find it hard to choose from the word pairs angelic devil or devilish angel to best describe my daughter. Probably very little philosophical thought lies behind the toy. 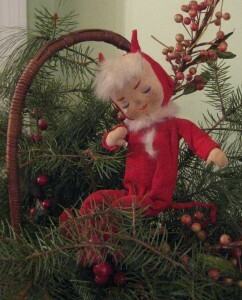 But if anyone has an idea, or is familiar with such a doll from the early 1960s, please let me know. And I wish you a devilishly good holiday! My husband’s family has vacationed in Cape Cod since he was a little boy. They cherish their time on the Cape. It’s a Family Tradition marked by capital letters and exclamation points. They will battle illness and adversity to reach the Cape. Fortunately, I appreciate the unique environment as much as they do. We began taking our daughter there when she was two. Her love of the Cape was immediate, as natural to her as breathing. H’s parents were immensely pleased with the discerning wisdom of their young granddaughter. Our quaint little rental cottages look out across the bay to the Pilgrim Monument in Provincetown and the lighthouse at the tip of the Cape. We feel privileged to spend time each summer in this transitional, luminous, glorious spot. As in such magical places as Cornwall, Mont St. Michel and Key West, the expected balance of land and water has shifted. The land resembles a narrow ribbon drifting on the water. The sky is vast. The light is awe-inspiring, ever-changing. The land itself is in constant flux. I was unprepared for the quiet drama of the bay. Growing up, my beach experiences were limited to the Gulf of Mexico and the Atlantic coasts of Georgia’s islands. Both are beautiful areas, but they lack the sharply defined tidal contrasts of Cape Cod Bay. Every year without fail, soon after we arrive, a knock at our screen door signals Grandpa’s delivery of our copies of the tide chart, our guide to daily life. At low tide, the flats extend nearly as far as the eye can see. The shallows glimmer like silver in the shifting sunlight. When the tide begins to rush in, the change is at first almost imperceptible. Before long, though, the water is swirling around us, its determined, unstoppable force clearly evident. At least once every day, we watch as the expanses of sand shrink into islands, smaller and smaller, before they become completely submerged again. *One final, fitting point of interest: our scallop shells wash ashore near the place where our country’s first pilgrims landed. As most of us learned and later forgot, the Mayflower’s initial stop in the new world was in what is now Provincetown Harbour. Our pinecone people needed another, similar species in their community, so we turned to our immense stash of corks. (I can’t imagine why we have so many corks!) 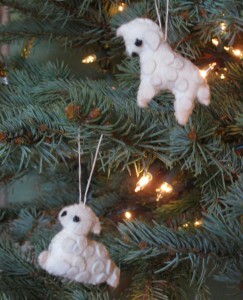 For these, we used pipe cleaner arms and legs, which can be bent creatively. Several wear scarves of narrow wired ribbon. 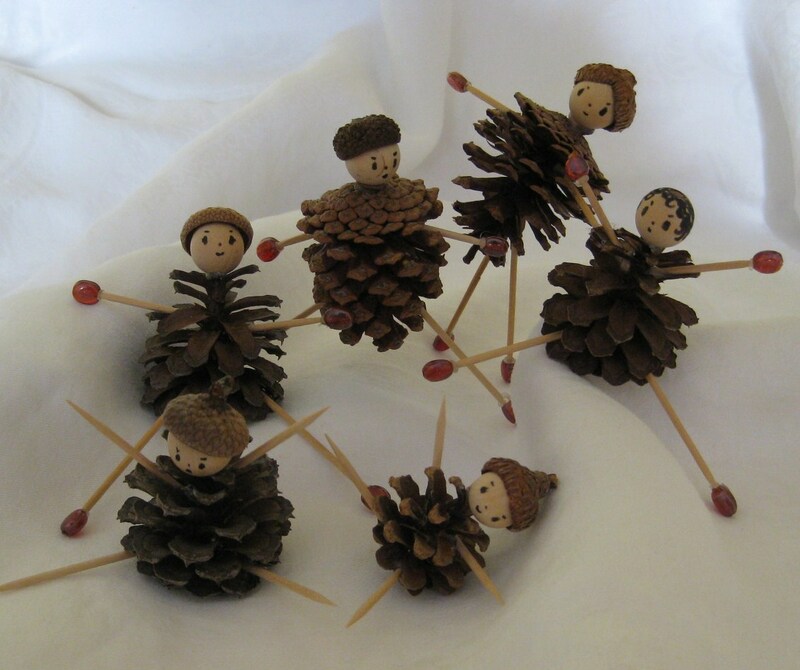 Some, like their pinecone friends, sport acorn caps, while others allow their wispy yarn hair to flow forth freely. 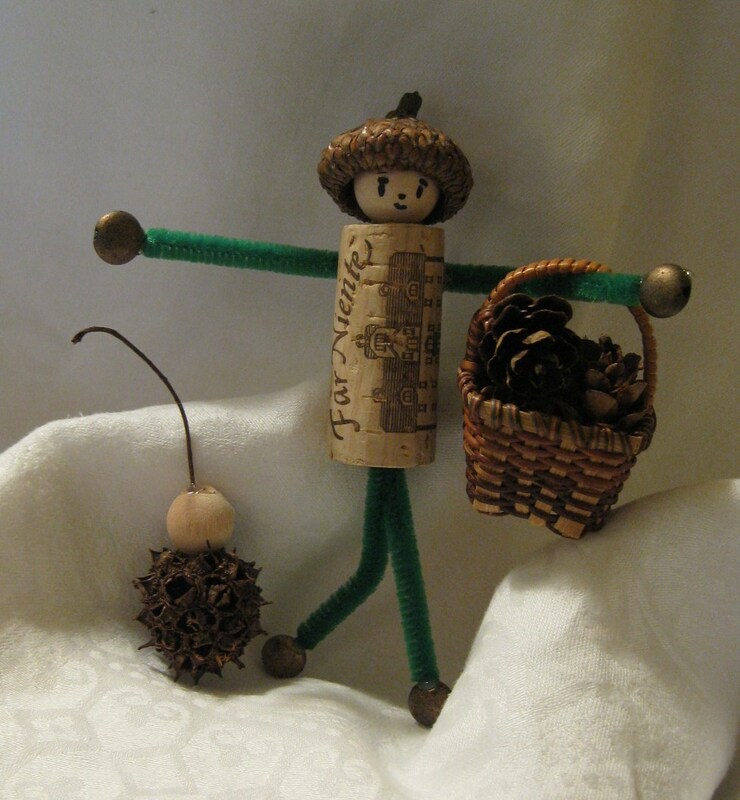 The cork and pinecone folk live together in a truly utopian society. The Charles Shaw corks have equal status with their Caymus colleagues, and the subtle differences in pinecone shapes are celebrated. Harmony and good will abound. The Christmas spirit flourishes all year long. A cork mother and her sycamore baby. 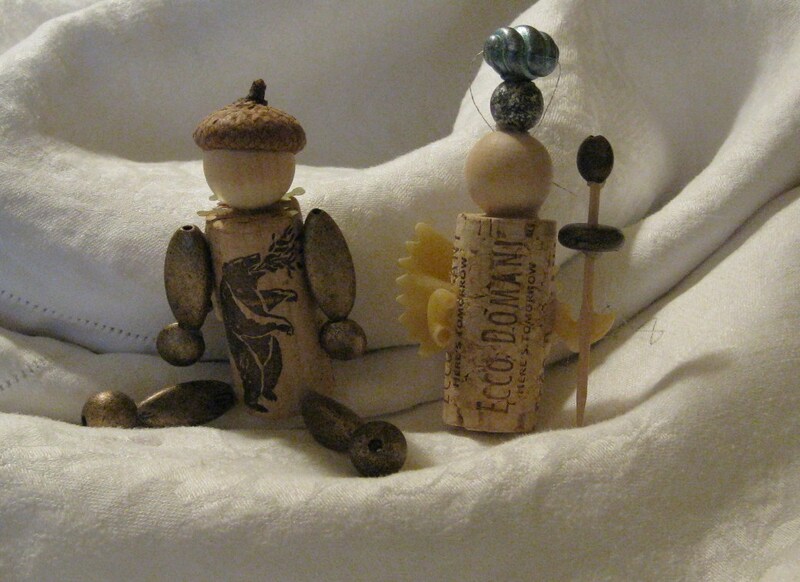 With beads and pasta, many cork creature variations are possible. My daughter was born on New Year’s Eve. We attribute her outsized love of Christmas to her so narrowly missing it that first year. She is definitely her grandmother’s girl—she inherited her talent for and love of Christmas crafts. She and I continue the tradition of holiday ornament-making that Mama started with me. Like her grandmother, D prefers to use found objects whenever possible. (Our family is historically green in the sense that we’d rather use what’s on hand, even if it means turning the house upside-down, instead of going to the store to get the exact right thing. We like the challenge of improvisation.) My daughter has always been a scavenger, a picker-upper of little things and bits of things that she sets aside for an unknown future use. She returned each day from Kindergarten with a different unidentifiable something she had found in the hallway or under a desk. Until recently she collected broken pencil tips. I give thanks everyday that she has outgrown the phase in which she pronounced every gray, forgettable rock along the road a priceless treasure: This is pretty! And so is this! And this tiny one is very beautiful! After even a short walk, our pockets were weighed down with gravel. I quietly returned them to the road later. 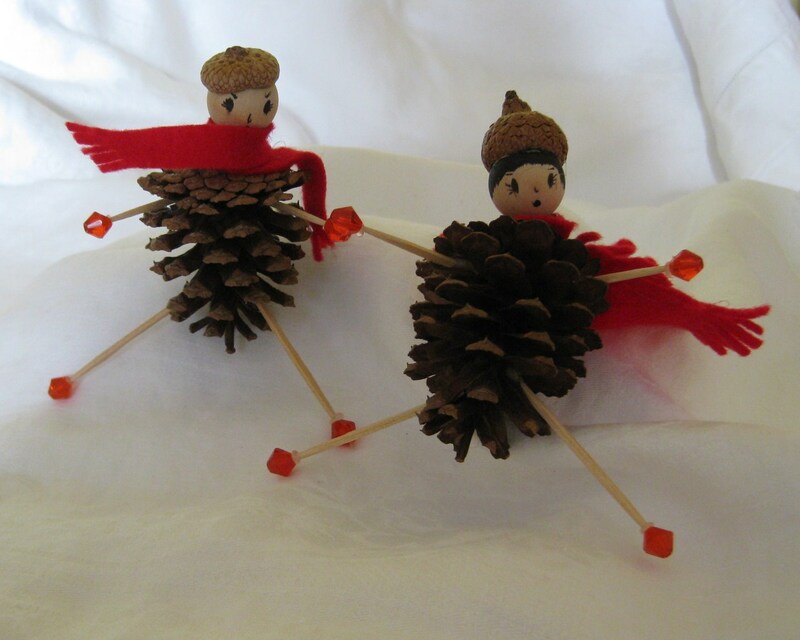 D was still in preschool when we made our pinecone people, but she already had a good sense of design. She quickly pushed for toothpick arms and legs. 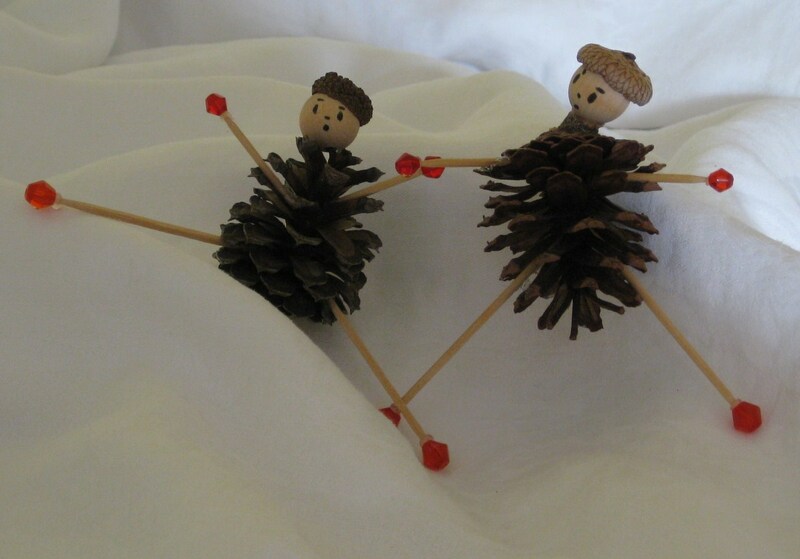 I couldn’t see it—the contrast between the rotund pinecone body and the skinny toothpick seemed too great. But she persisted (she’s stubborn, as well as crafty), and so I agreed to give it a try. Thanks to the magic of the hot glue gun, it was possible to affix the toothpicks down in the depths of each pinecone. And D’s idea was a good one. The resulting figures are particularly active and expressive. They sit, stand, or jump to attention. 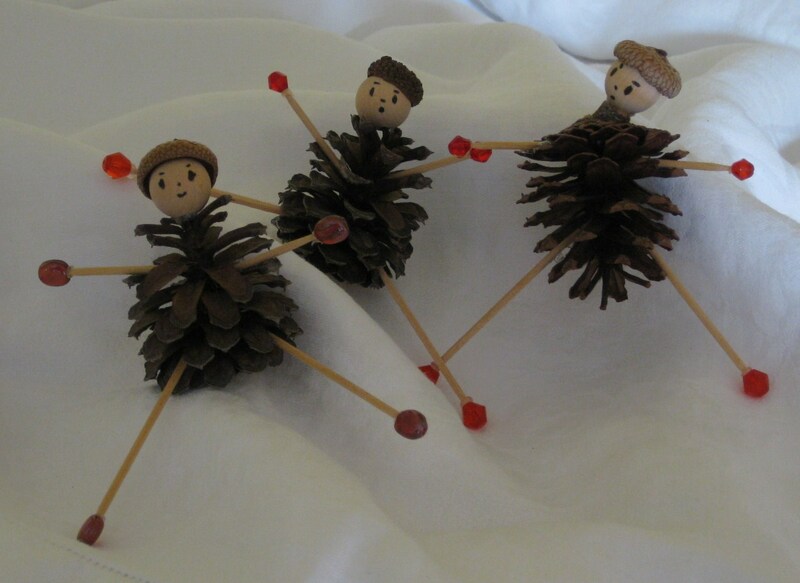 Wooden bead heads, jaunty acorn caps, and smaller colored beads for hands and feet completed our woodland people. We drew facial features with a Sharpie. 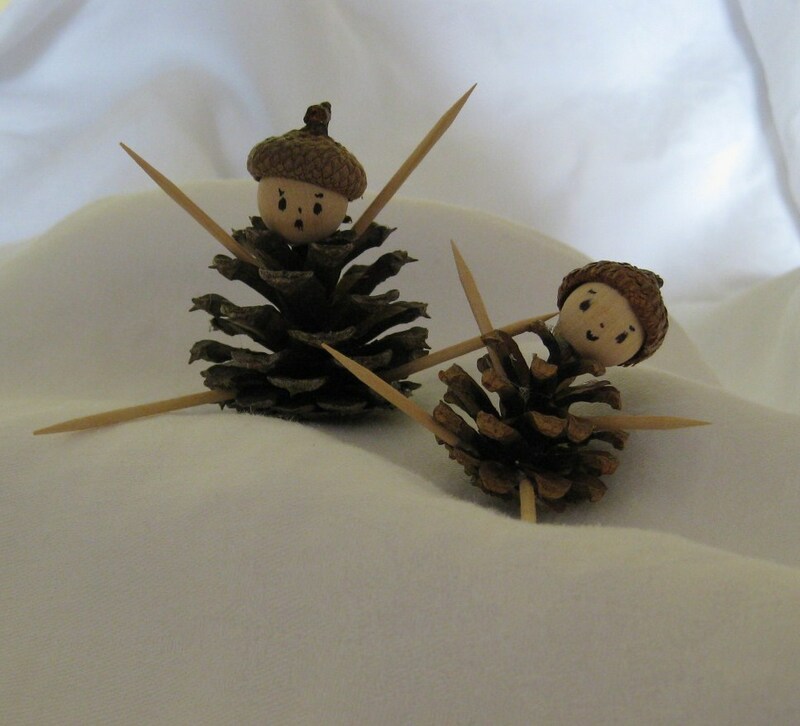 Some of these piney creatures come out in early fall to mix it up with pumpkins, gourds and leaves. Others, outfitted in red felt capes and scarves, don’t appear until December. I love the charming simplicity of our pinecone folk. They remind me that a little magic may be born of the most ordinary circumstances and materials, if we pause and open our hearts to the possibility. Such opportunities between parent and child become increasingly rare as our children mature. My advice as the mother of an almost-teen: recognize and treasure those moments! Family and friends began giving my daughter Christmas picture books as her first birthday approached. She has quite a collection now. 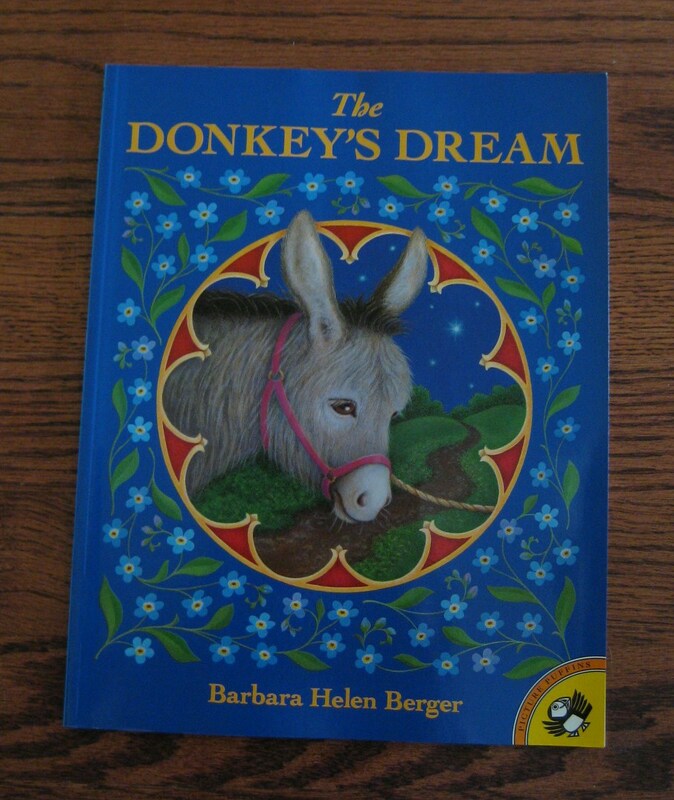 Two of our favorites are The Donkey’s Dream, by Barbara Helen Berger, and The Christmas Donkey, by Gillian McClure. 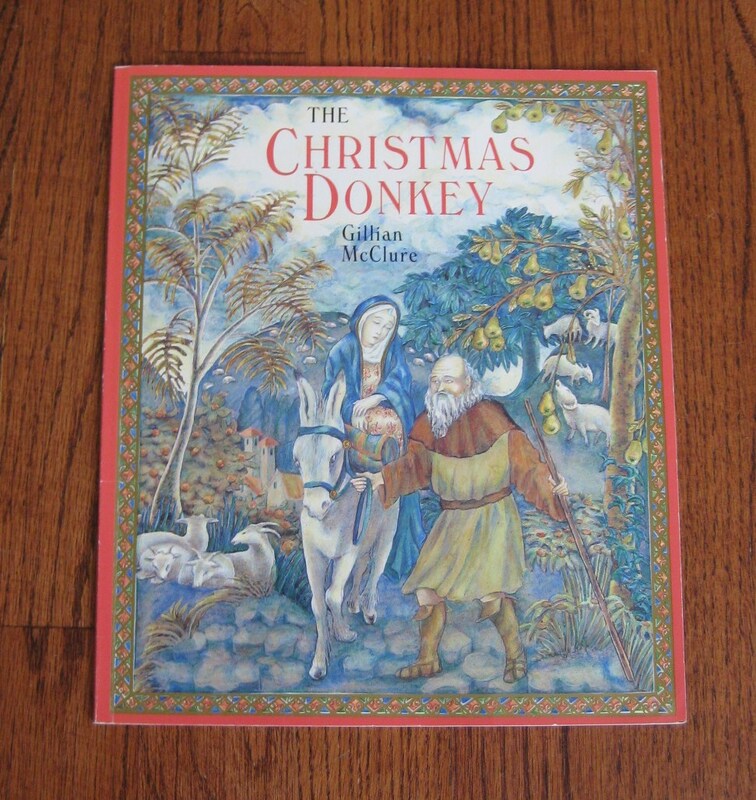 The subject of both books is the donkey that carried Mary and her unborn baby to Bethlehem. 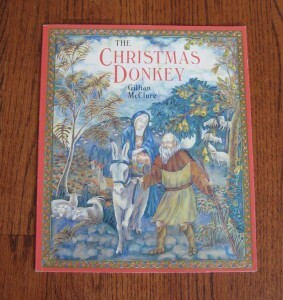 The life of this ordinary donkey is powerfully transformed by his participation in the Christmas miracle. 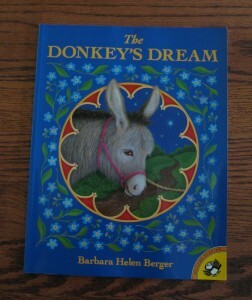 The stories are lovely, as are the illustrations, which recall medieval illuminated manuscripts. 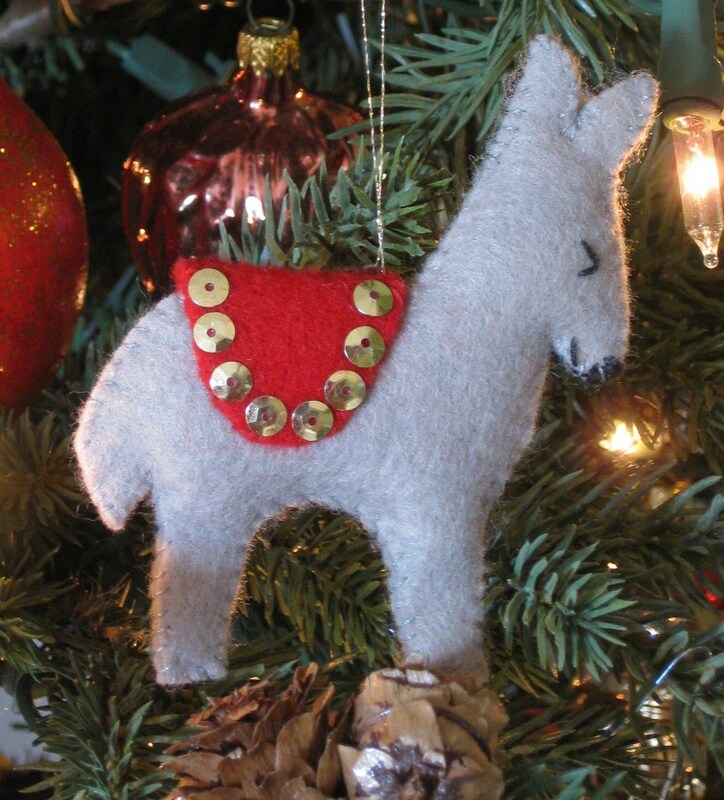 The two books brought special meaning to this sweet little gray donkey I made as a somewhat later addition to our felt ornaments. 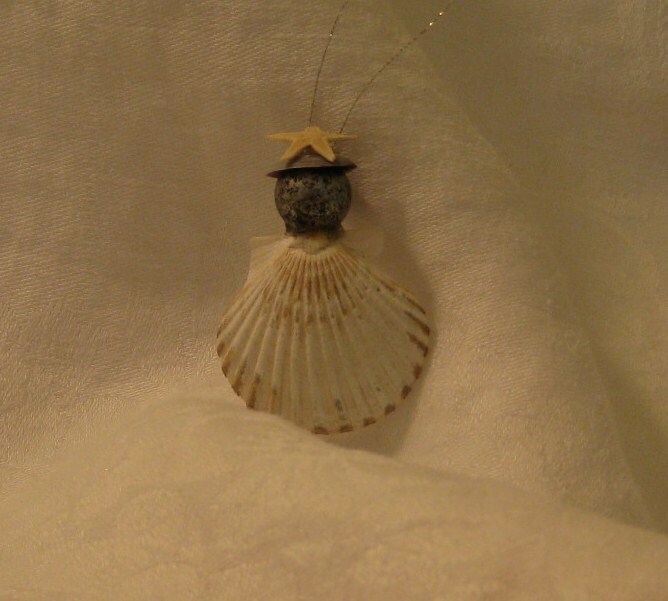 He is unique–strangely, I only made one. that witnesssed the miraculous birth. 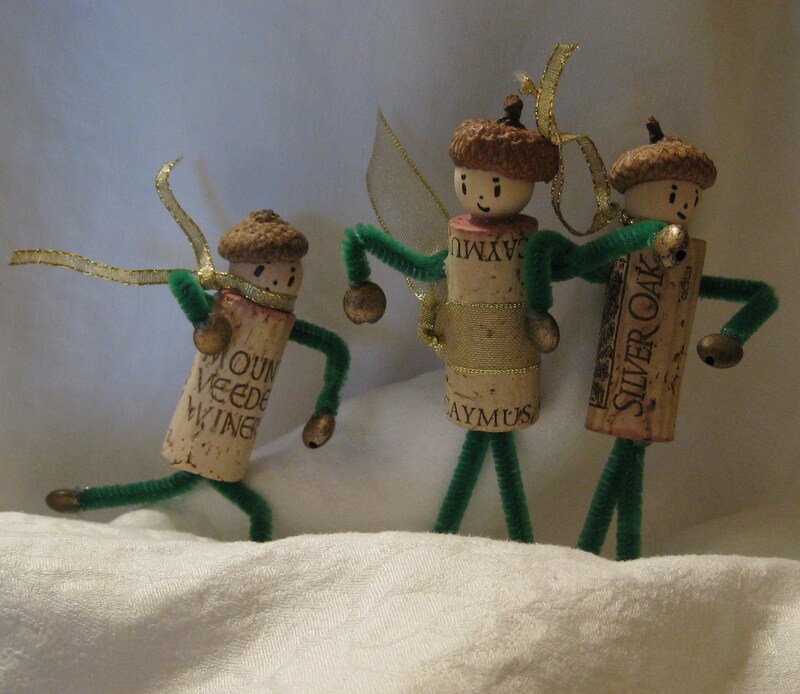 These little angels are made of pasta except for their wooden heads, the occasional bead halo or acorn-cap. 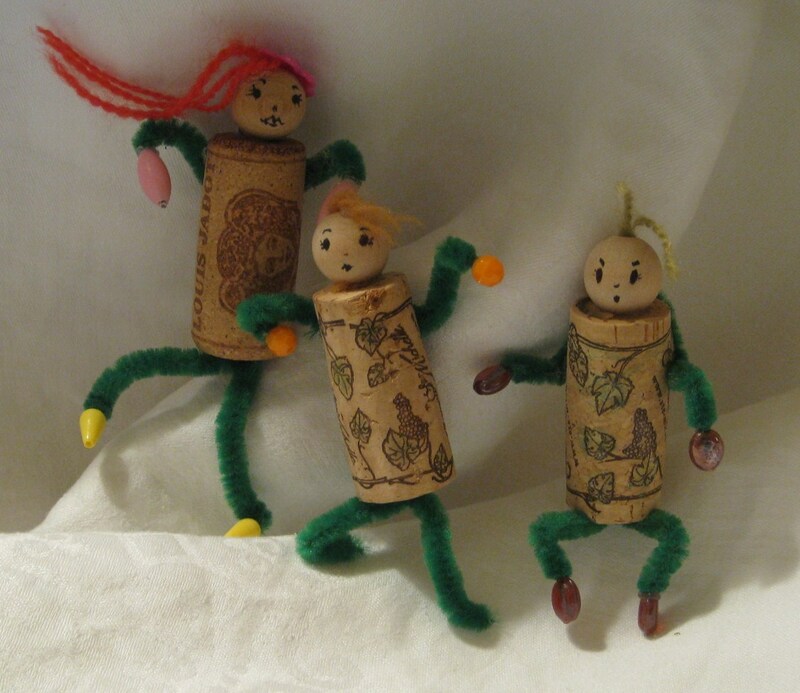 Assemble them with a good white glue like Sobo or use a hot glue gun. 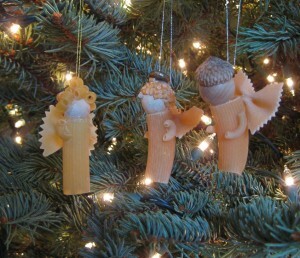 While they can be painted or dusted in glitter, I prefer the natural color of the pasta, which glows beautifully in the tree lights. 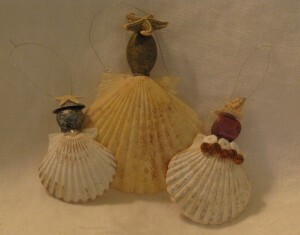 The two angels on the right show their age in their darker color. 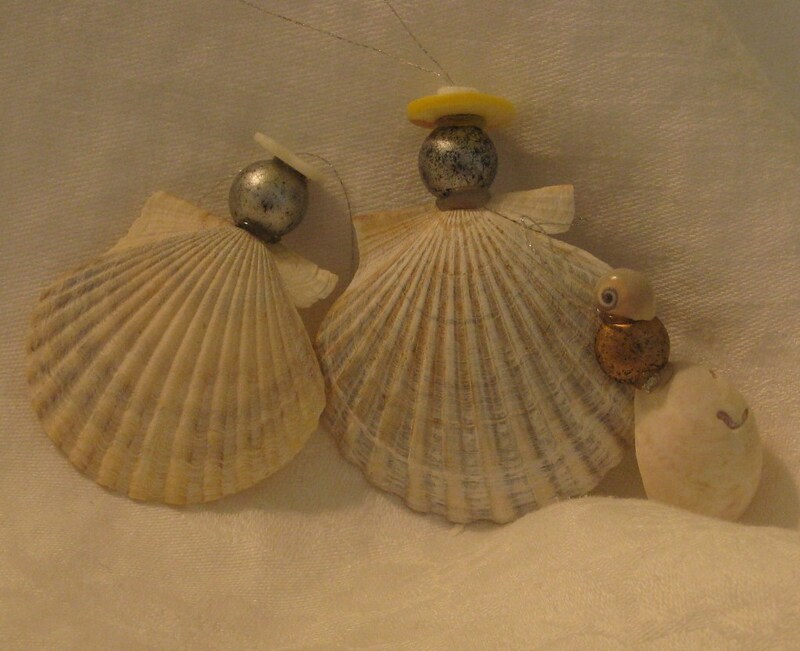 They date from my father’s angel-making period in the 1980s. 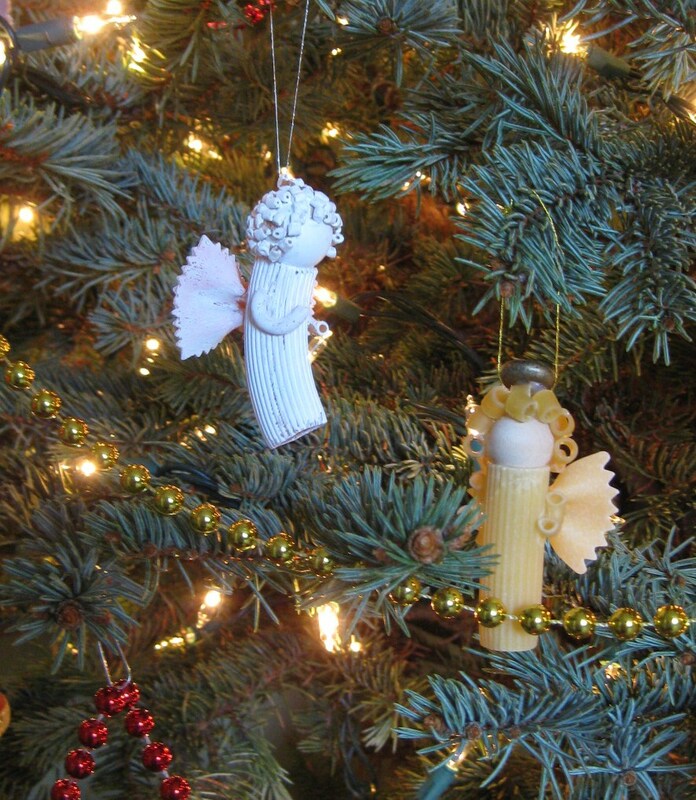 The lighter colored angel was made a year ago.